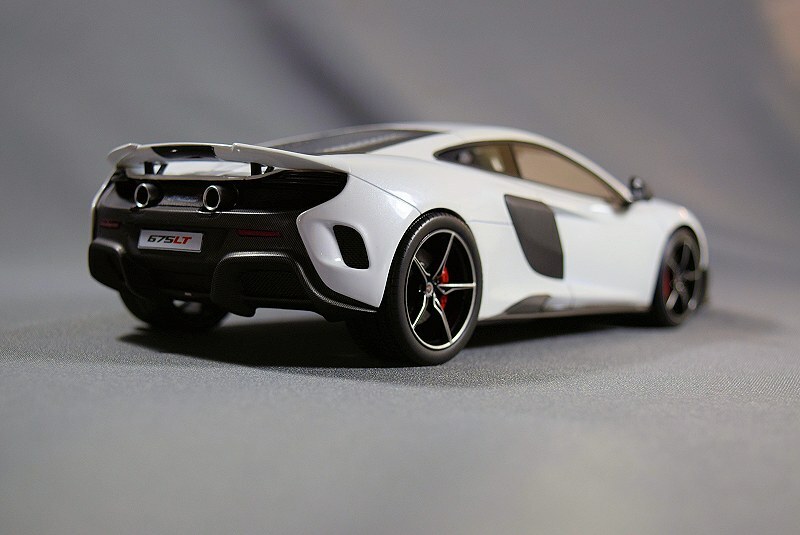 The team at TopSpeed were gracious enough to forward a sample model of their latest venture, the McLaren 675LT. 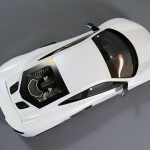 If you haven’t heard of the brand, they are relatively new, a sister company of TrueScale Miniatures. 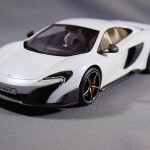 Their focus at the moment is on sport and supercars from various marques. While incorporating a balance between price and quality, the end result is quite satisfying, to say the least. 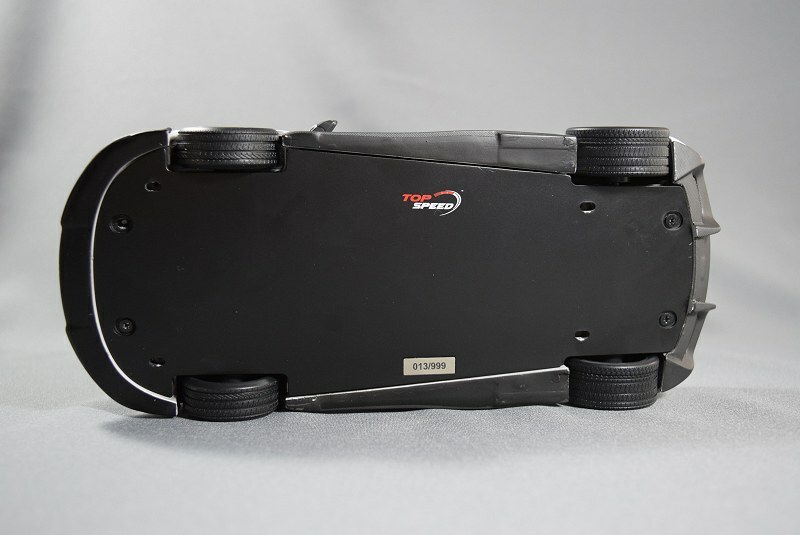 TopSpeed pieces retail for a suggested 135US, which make them comparable to their competitors – GT Spirit. 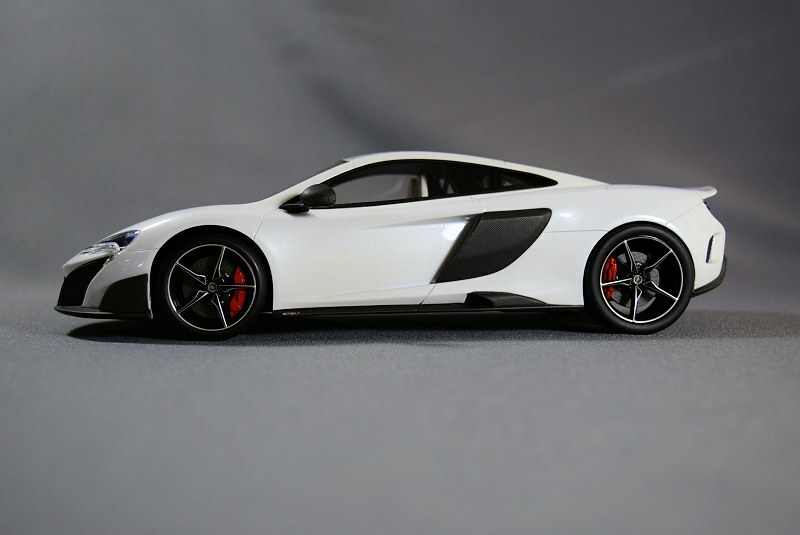 Since this is our first presentation of a TopSpeed scale model, I thought I would share the exterior packaging for you all. The box is huge, larger than your typical scale piece. 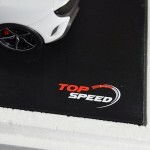 Reason being each model ships with a sizable wood base which incorporates the TopSpeed logo – see photos. 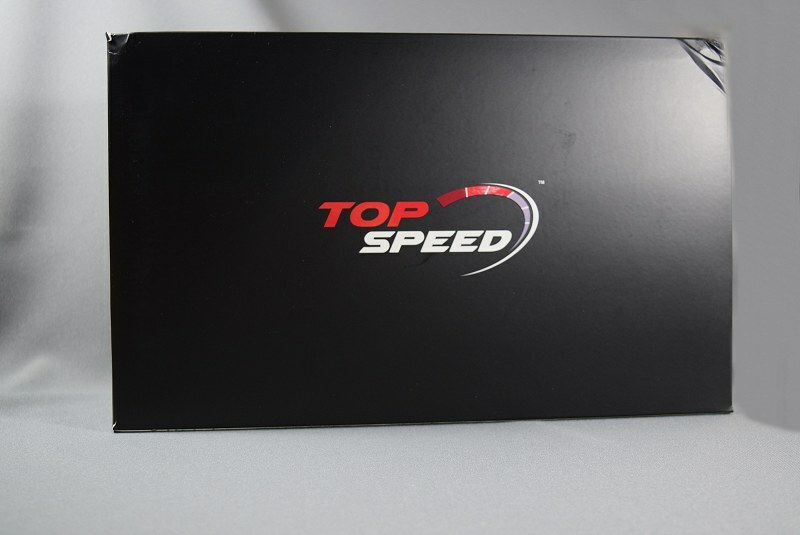 The exterior box is all black with a notable TopSpeed logo and informational literature rear and side. 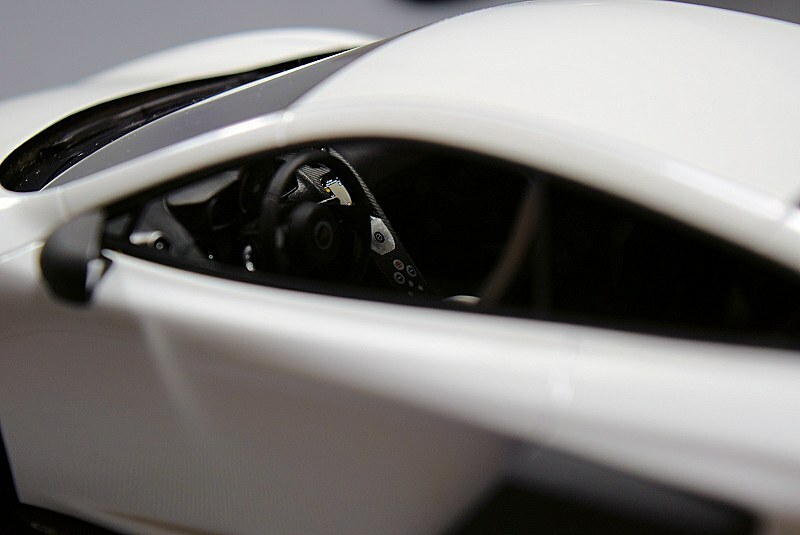 Inside, the model is encased by a styrofoam shell. Our sample arrived safe and sound. 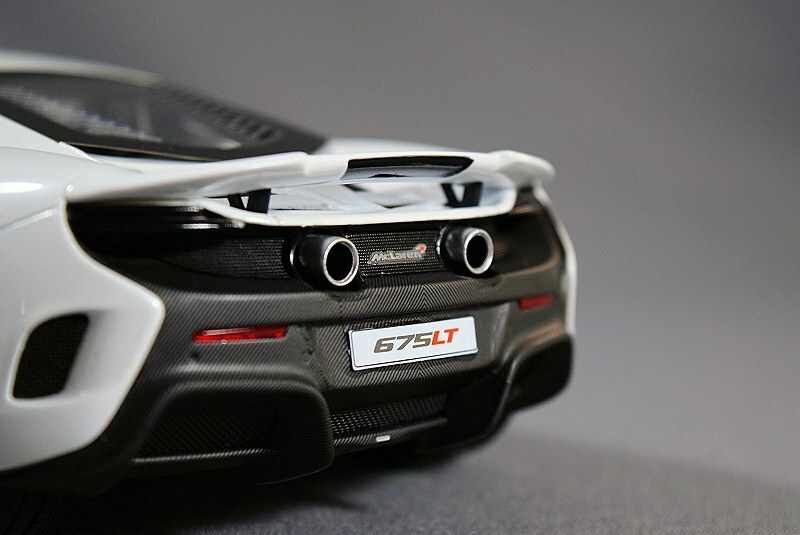 Remove four screws from the wood base and the McLaren 675LT is set free. 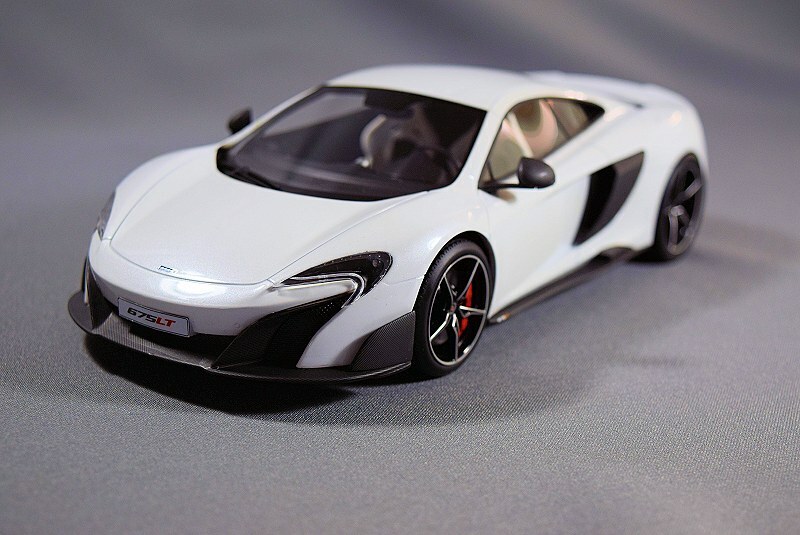 The exterior of the McLaren 675LT is finished in Silica White. 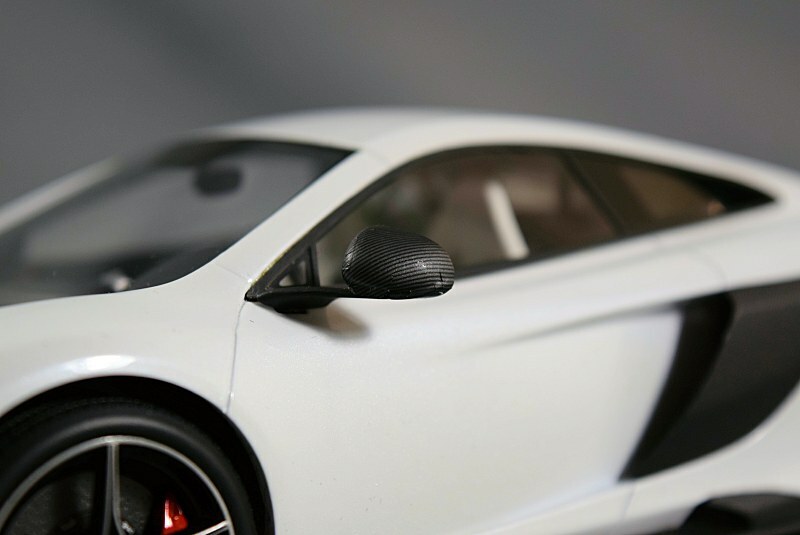 Paint on the model is applied with precision and care. It looks great! 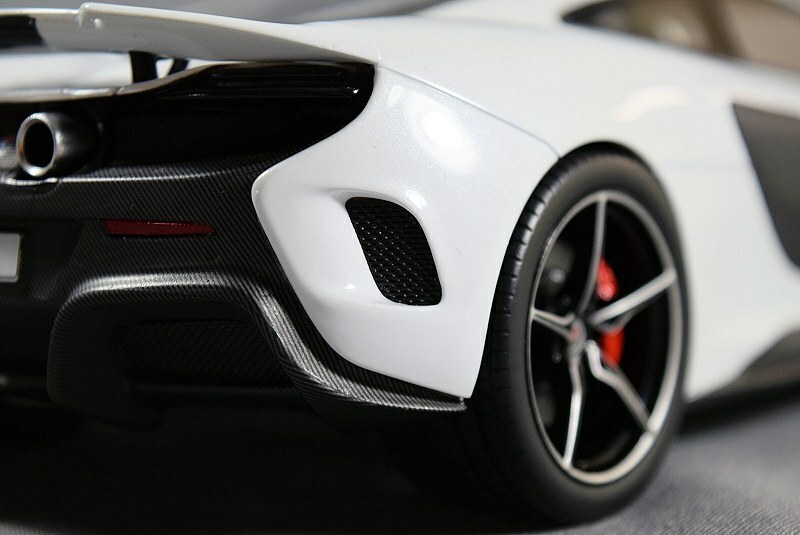 Carbon fibre execution and application is good, though I’ve seen better, but usually in higher price point pieces. 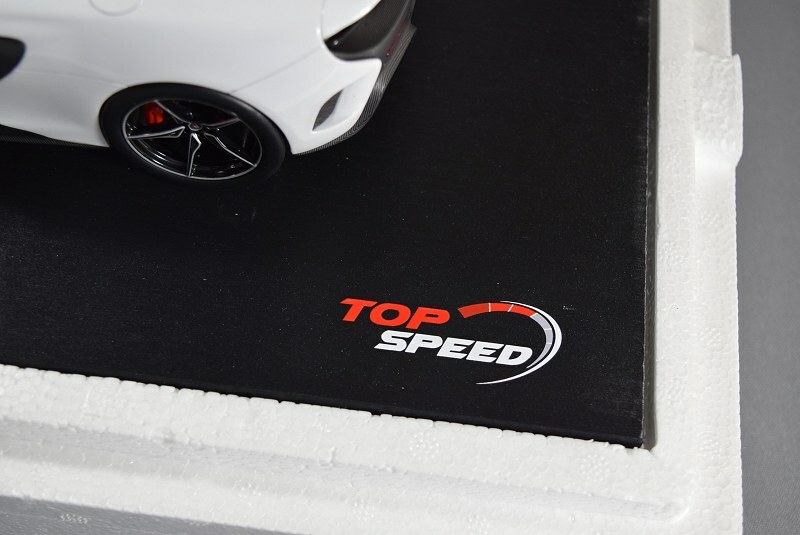 No issues with shutlines or panel gaps as the TopSpeed series models are all completed in sealed resin. If I have to complain about something it would be the ride stance. 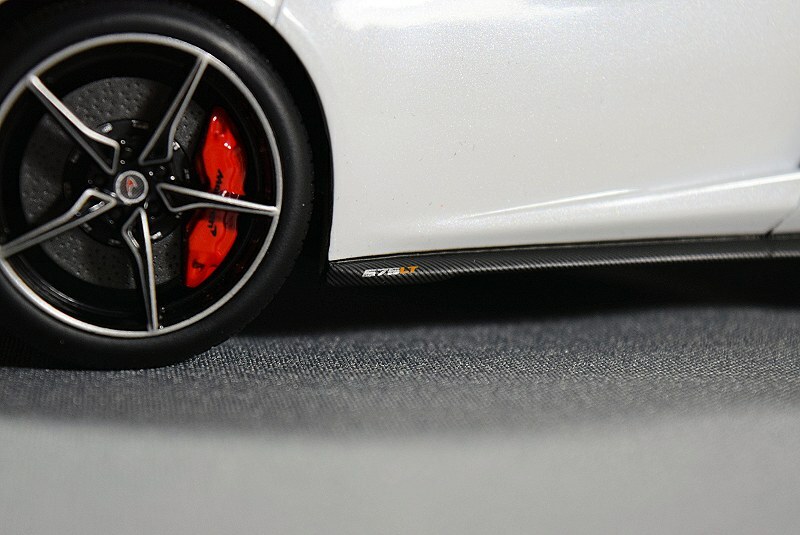 Seems the optional lift kit is stuck in the high option in the front of the car – the gap is too high while the rear seems to be inline. 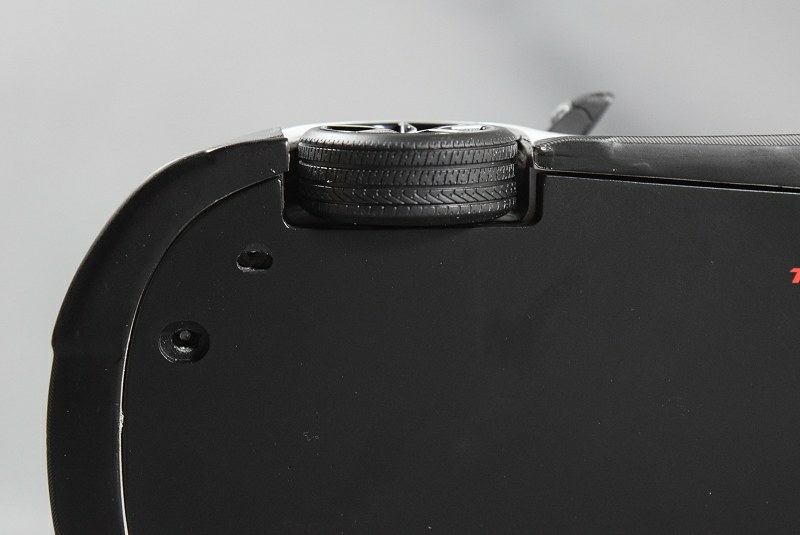 We’re had a DS forum member mention the same on the stance, so I don’t believe this issue is exclusive to our sample piece. I do appreciate the attention to detail on the gas cap/lid. 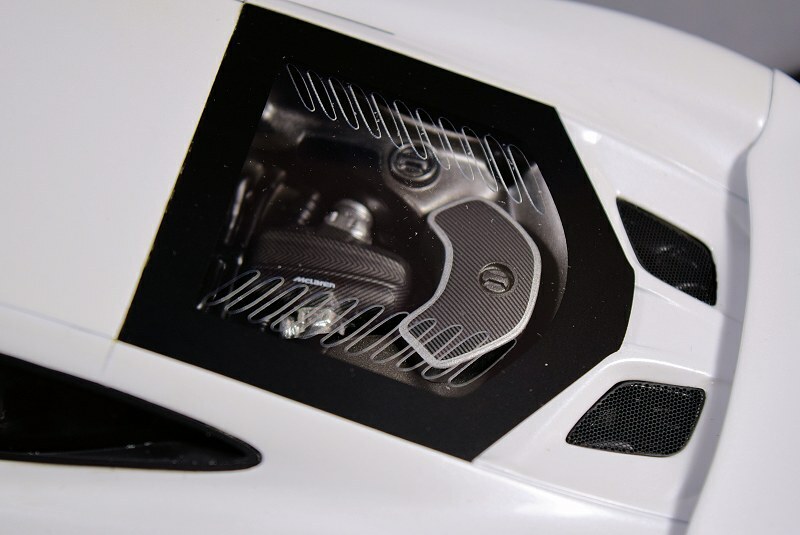 Instead on the typical flat and full of paint from other manufacturers, TopSpeed added some depth. 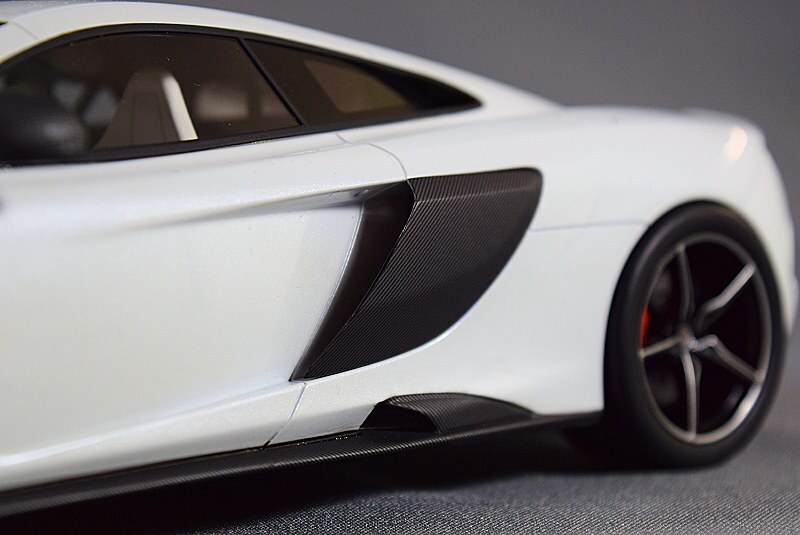 Overall the exterior lines on the McLaren 675LT do justice to the original. 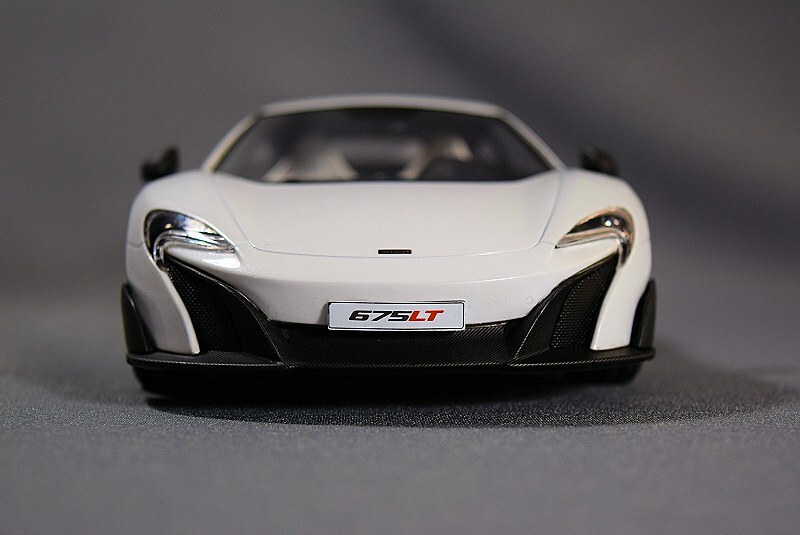 Moving to the front of the McLaren 675LT you will notice the nicely crafted front intake with lower aerodynamic chin spoiler. There are no perforated grilles here. 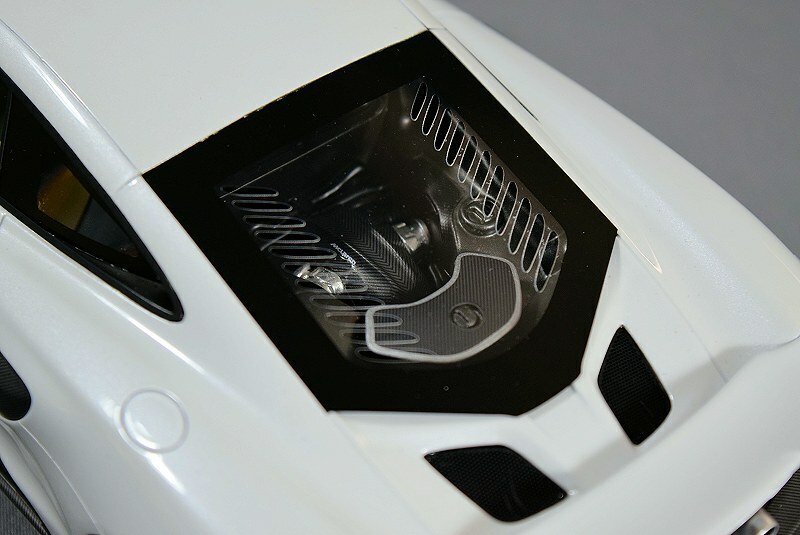 Detail on the headlights is good and front logo is a simple flat decal. 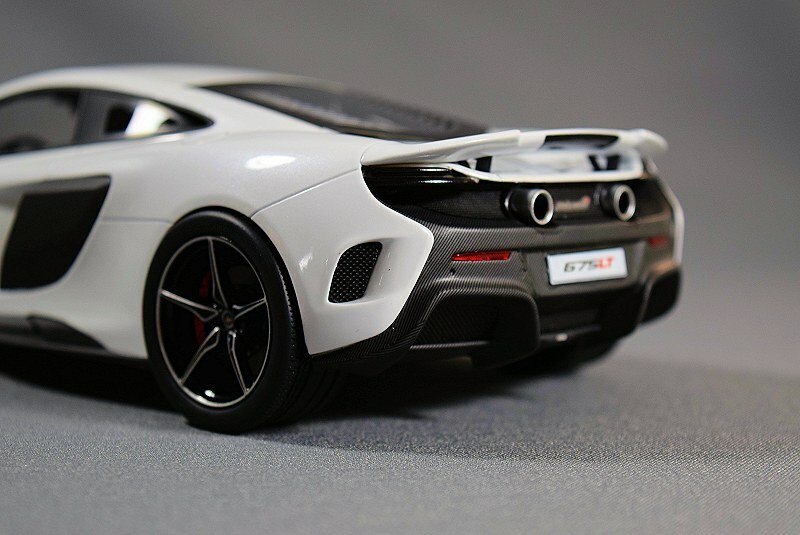 The rear is much like the front, very nicely done. 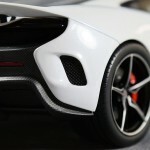 I give props on the carbon fiber working, as there is a lot here. 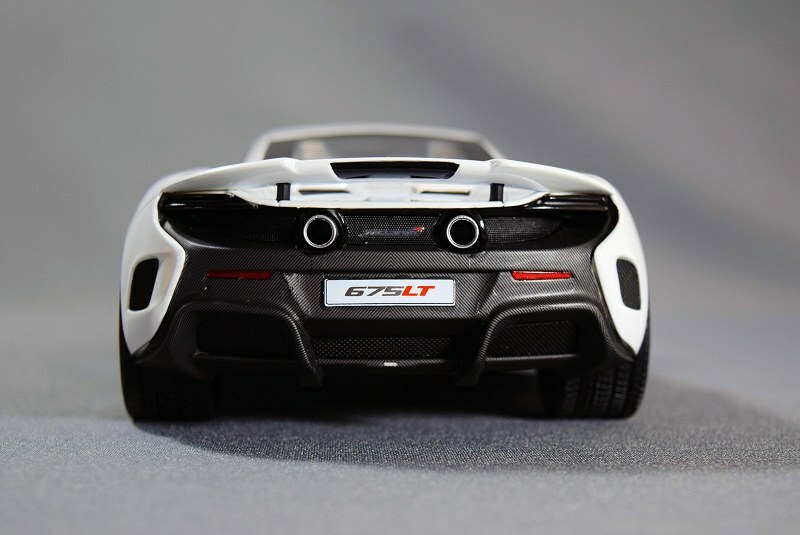 All the elements of the rear are here and well inline with the 1:1. 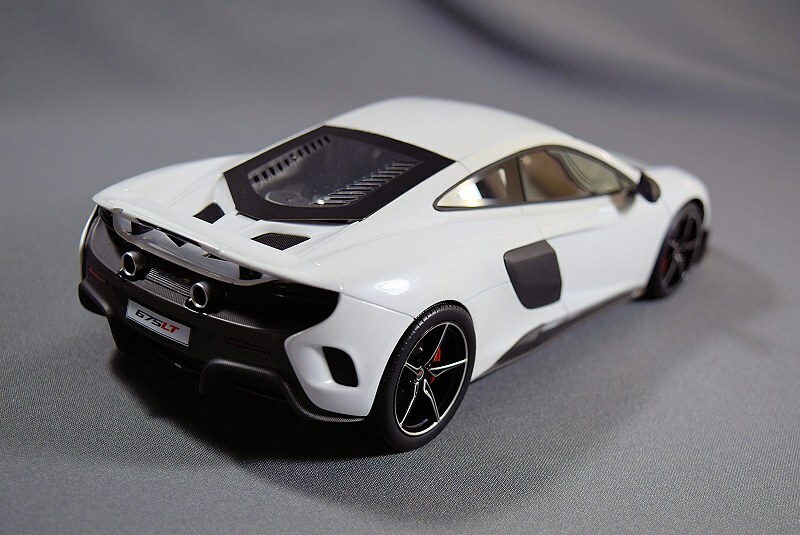 TopSpeed decided to release the model with the spoiler in the down position. Good move on their part as it flows perfectly with the exterior lines. The wheels are a work of art. 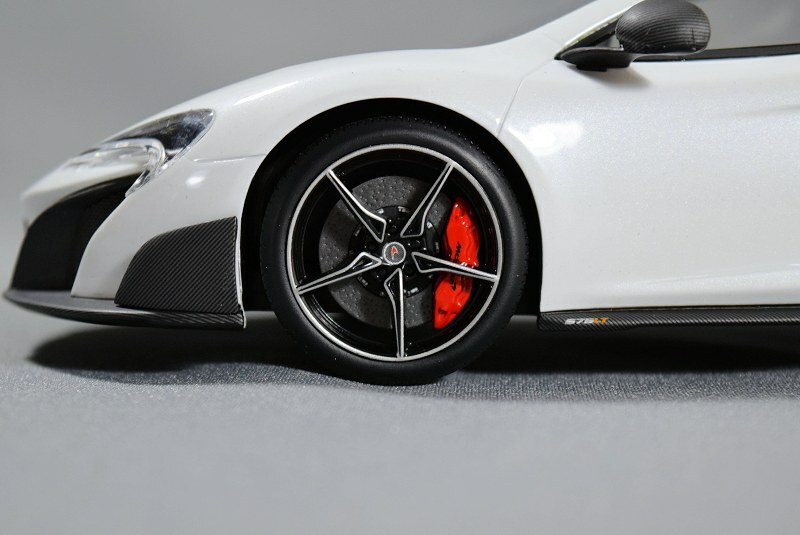 The entire package is executed well; this includes the carbon rotors and calipers and McLaren logo to boot. 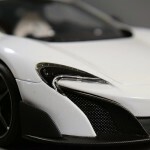 Something I love to see on my scale models. Well done guys! 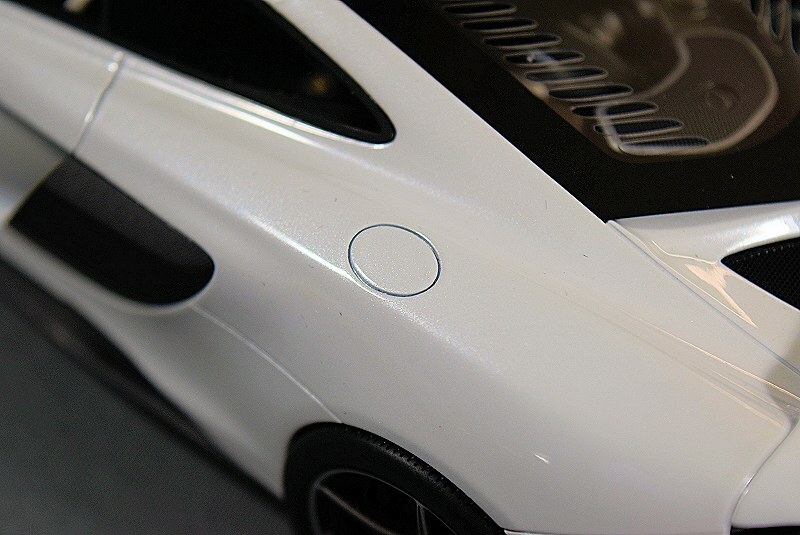 The heart of the McLaren 675LT is covered a thin piece of clear plastic, similar to what is used on the exterior windows. It does the job, but it feels and looks fragile in nature. 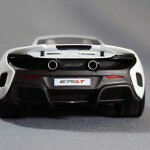 The motor detail itself is quite impressive, much better than I would have anticipated. You’ll all be pleased with it I’m sure. 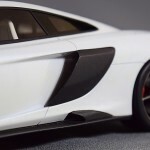 Paint, carbon fibre and decals all add to the layers and depth, which adds the realism us collectors crave! 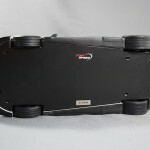 The undercarriage of the model is quite simple as the photos will show. 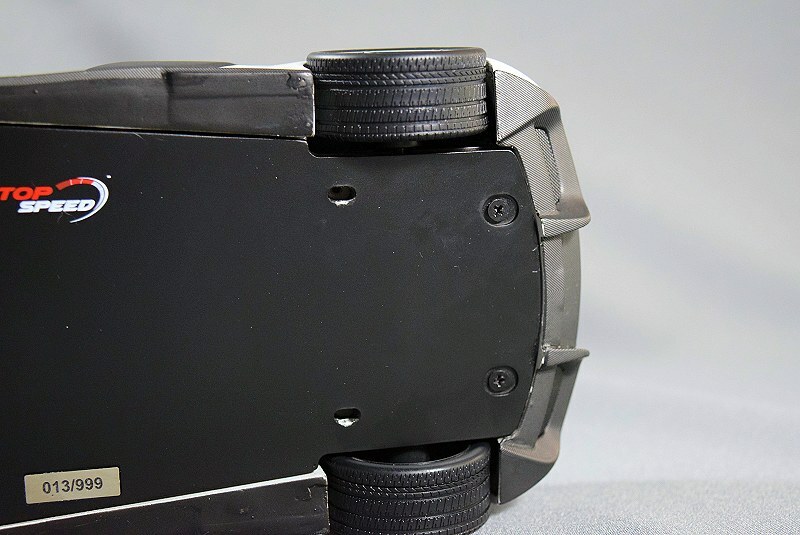 I would recommend a little more care and refinement in the finished product and ensure wheel wells are fully covered in black too. 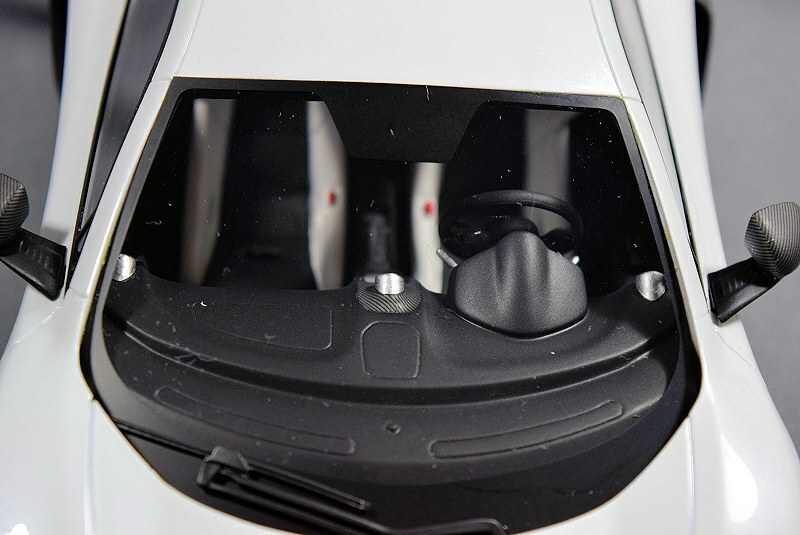 The cockpit is well attended to, not one element is crazy and over the top, but the entire package works well at replicating the inner workings and beauty of the McLaren 675LT. 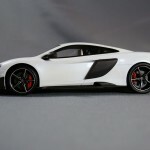 For one, colour matching the interior seats with the exterior white is a good move. I do apologize for the simple images, still working out the bugs with the new photography kit. TopSpeed I’m impressed! 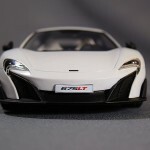 For your second effort after the initial Honda NSX, your team is heading in the right direction. Please take note of my simple criticisms above. One thing I would truly change is to delete the wood base from future releases. NO true collector wants them or would utilize them. SPACE is always at a premium for any collector, so I promise you 99% of the time they remain in the box or worst thrown out. Take the added saving in reducing the overall box size and no base to focus on refinement. This includes more photo-etched bits and related elements. I will guarantee a more warmer welcome from a broader base of collectors. 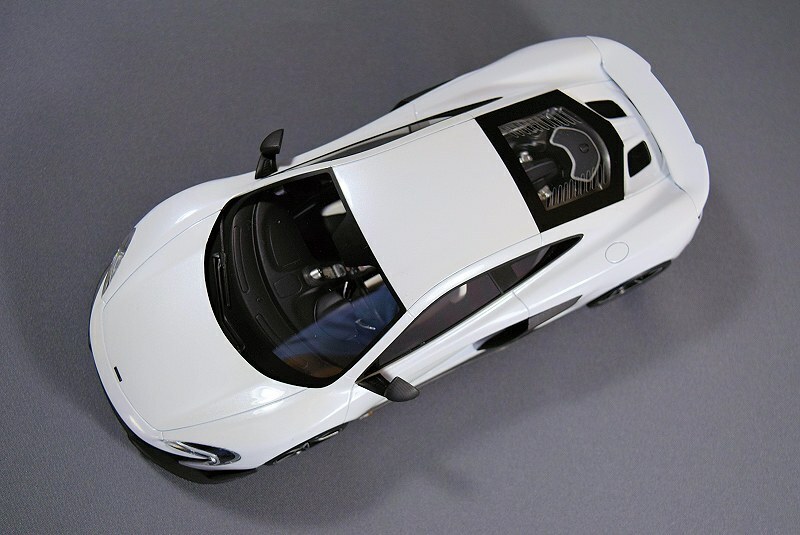 And to those collectors that may be thinking or want to ask, YES, this model is as good as any GT Spirit product I’ve reviewed to date. Enjoy the pics! 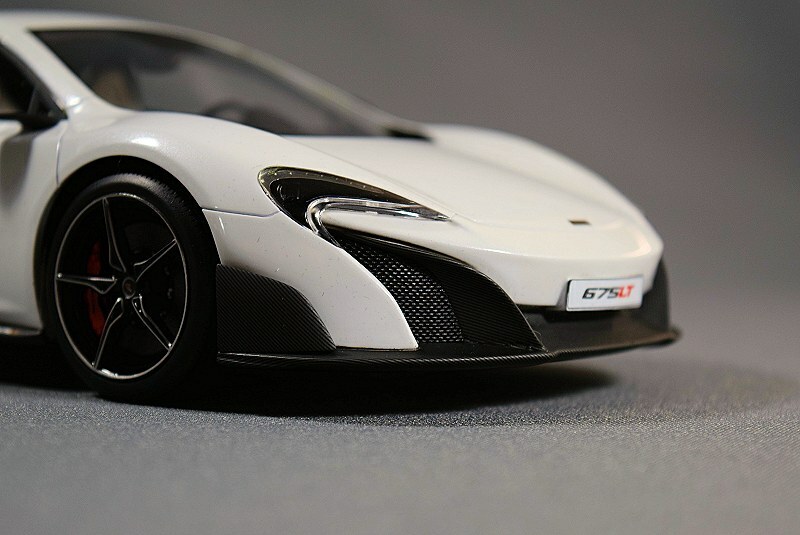 11 Responses to "REVIEW: TopSpeed McLaren 675LT"
Mine arrived this past week, and I am very pleased. I highly recommend this one. On a different note, I have to say that I somewhat take offense at your statement that no “true collector” would ever leave the model attached to it’s base. I have a pretty sizeable collection that I am quite proud of. 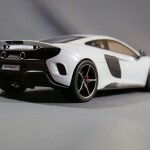 I have several Tecnomodels, Top Marques, and both released Top Speed models. I have left every one on it’s base. Am I to understand that since I do not display them like you do, I am not a “true collector”? I think you could have worded that better, don’t you? The statement was not intended to offend or lay any malice. 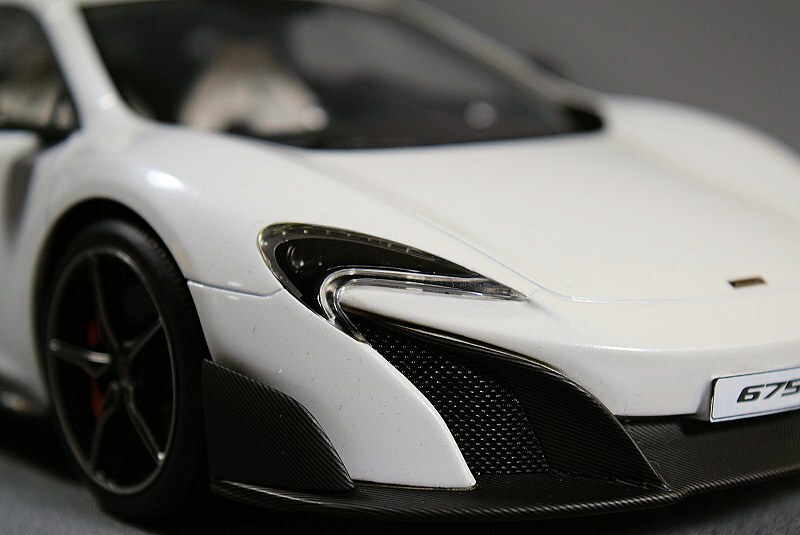 It’s meaning was to communicate that anyone with substantial sized collection on display would never consider utilizing any base, the footprint it too big, and as we all know, space is premium for any collector. I rather see the $$ spent of refining something good to something even better! 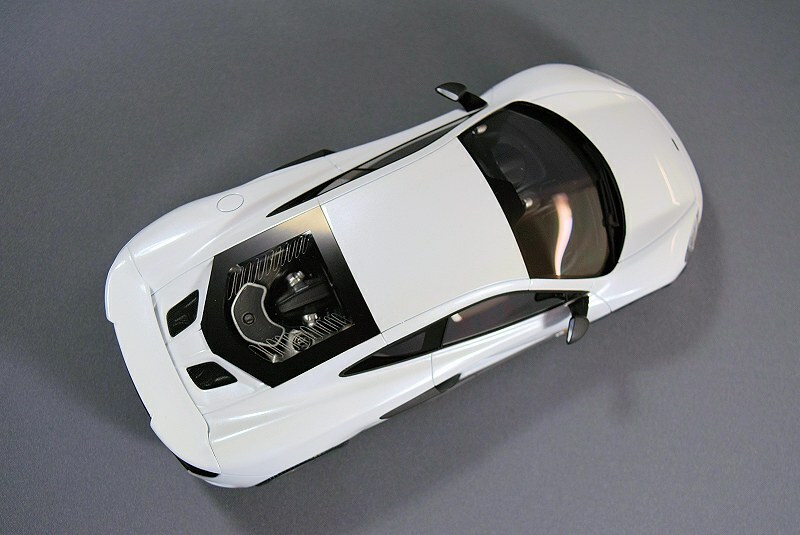 I’m looking forward to finally getting their Ford GT this month. 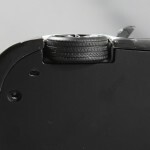 Hoping due to the delay they really tried to minimize the QC issues. Nice write up. 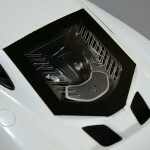 Anyone aware of CDN dealers for TOP SPEED or do we have to go to their site? 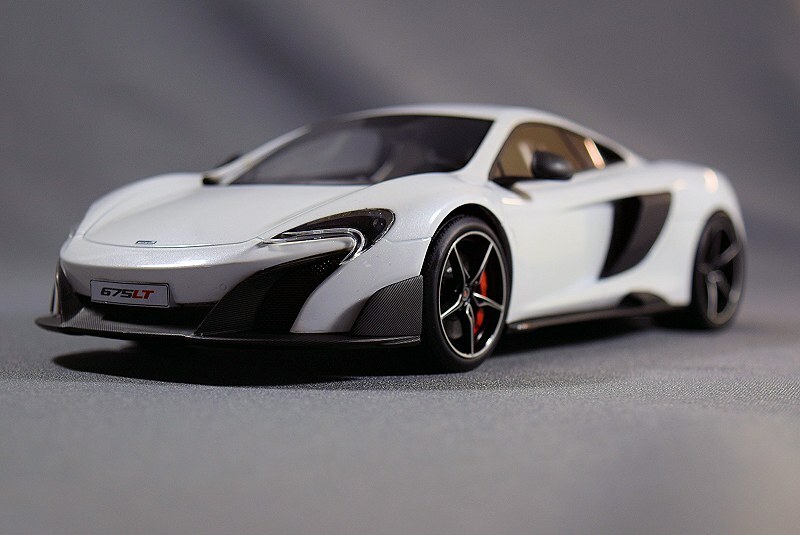 So, I don’t know which one to chose now, this one or the Alfa Romeo 4C by AutoART? Can you help me here? BUY what YOU like best!